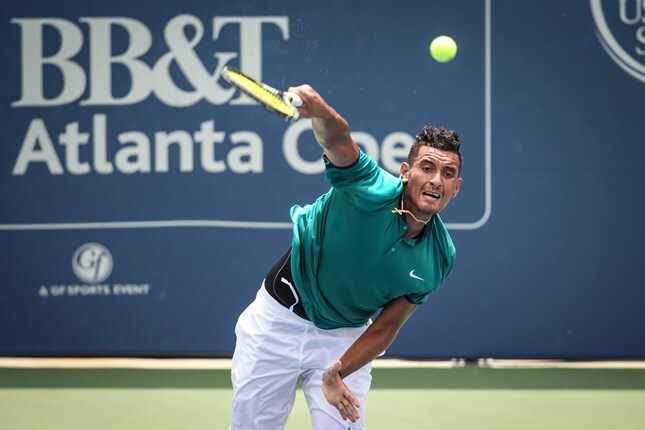 Nick Kyrgios, the 2016 BB&T Atlanta Open champion, has done what he was asked to do. He has gone about the process quietly, no fussing, he has fulfilled his obligations, he has seen the sports psychologist demanded by his trade union and he is ready to play again. Kyrgios is presently at home in Australia, relaxing and re-charging for the exhilarating year ahead. Whether the sessions he spent talking about his game and behavior to a complete stranger – however qualified - will have any effect, we shall have to wait and see. There is no doubt that armed with the right resources, the right attitude, the right support, and no sudden seizing up of his right arm, Kyrgios will soon be in the mix to be a top ten player – he is currently three short of this exalted group – and London will be hoping to have a sight of him when the 2017 ATP World Tour Finals come around. Meanwhile the last shreds of the official men’s season were played out to astonishing attendances at the 2016 World Tour Finals. Where else in the world would 15,000 people be lured to a rather remote venue on a Monday afternoon to watch one doubles and one singles match? The top eight singles and 16 doubles players of the year drew Brits into the O2 arena in south London in droves once more. No Federer. No Nadal. No fall-off in ticket sales. If one can be finicky about the finals it is that the event lacked for touches of spite and spice, albeit Andy Murray claimed an astonishing fifth successive tournament victory to secure the end-of-year No.1 ranking, becoming the first man from his nation to do so. Britain is in raptures. The tennis, especially that from Murray, was often epic. Novak Djokovic – who ultimately reached the final - got a bit uppity, thumping a ball into the stands in his first match, provoking a spat with a reporter who subsequently received unflattering comments from the Serb’s fan club on social media. Novak lacked focus in the last six months of 2016 but there are no directives for him to seek psychological help. The ATP decided to come down hard on Kyrgios after his performance – or rather non-performance – in Shanghai against Mischa Zverev in late October. Kyrgios patently didn’t want to play and while in hindsight he should have withdrawn from the Masters and faced the consequences [he had won the Toyko tournament the week before and was clearly shattered]. Having taken on the responsibility of playing in Shanghai, he should at least have displayed a competitive urge. That is what athletes do, whether they are low on energy or not. Soon after his transgressions, it was concluded by the ATP Tour that he had demonstrated a level of conduct that ran contrary to the integrity of the game. The meant that he received an additional fine of $25,000 [on top of his original $16,000], and was suspended from tournaments for eight weeks, effective through Sunday, Jan 15, 2017. That would have seriously imperiled his chances of competing in his home nation’s Australian Open, which starts in mid-January. The ATP then said the suspension would be reduced to three weeks, “upon agreement that the player enters a plan of care under the direction of a sports psychologist, or an equivalent plan approved by ATP, meaning Kyrgios could regain eligibility to compete on the ATP World Tour or Challenger Tour from (Monday, Nov 7, 2016).” He has taken the ATP’s words on board, he has done what they asked, and he is now busily preparing for the 2017 season. Kyrgios is a huge talent, arguably the hugest at the disposal of the men’s game that, by the next 12 months, is likely to have seen the last of Federer and Nadal as title-challenging competitive forces. They are winding down and why shouldn’t they? What these two have achieved for the sport is, perhaps, beyond parallel. It is understandable that Jerry Solomon, the entrepreneur behind the BNP Paribas Showdown at Madison Square Garden – the centrepiece of World Tennis Day – would have wanted to secure the services of the 21-year-old Australian for the event on Monday, March 6 of next year. Kyrgios and Jack Sock are the young lions on view, the best young player in the world against the best young American player. It stands to reason: they are both box-office and tennis needs box-office. Given Kyrgios’s recent antics, eyebrows have been raised and doubts expressed as to whether he was all right for the night. Solomon sought to placate one dismayed patron of the Garden who said she would give up the tickets she had regularly taken after hearing Kyrgios was in the field. The tournament director’s response is one that should be absorbed with respect and admiration before we become too condemnatory about a player who has shown himself to be a real favorite, especially with the younger fans who are vital to retain and engage for tennis to stay relevant in the face of so much competition, both from other sports and other, less recreational pursuits. Solomon wrote: “The fact is that, while struggling to find a comfort level on the pro tour, Nick has shown himself to be not only a highly talented athlete but a soft spoken, easy going, and respectful young man. While that may be contradictory to some of his behavior and certainly contrary to much of the press, we know that from first hand experience with him at our Atlanta ATP Tour/US Open Series event which he won this past summer and where he made a lot of friends as he took time with the fans, press, and sponsors on his way to victory. “The point is that we choose not to condemn any of the players and in fact have brought to the Madison Square Garden court several players who over the course of their distinguished careers have done things which may not have been in their own best interests or that of the game. But tennis is a sport of individuals who express themselves in many ways and who we, the fans, ask to grow, mature and learn while we watch, comment and voice our approval or disapproval. Neither John nor Jimmy would claim to have been paragons of virtue on the tennis court during their playing careers. They were animalistic in their own distinct ways but they never stopped striving to be the best they could be. For what it’s worth, I believe Connors and Kyrgios would be an exceptional fit. And I suspect the patron who wrote to Jerry Solomon wanting a refund for the tickets she had purchased for next year’s Showdown would have an immediate change of heart should Connors be arriving w/ Kyrgios at Madison Square Garden.